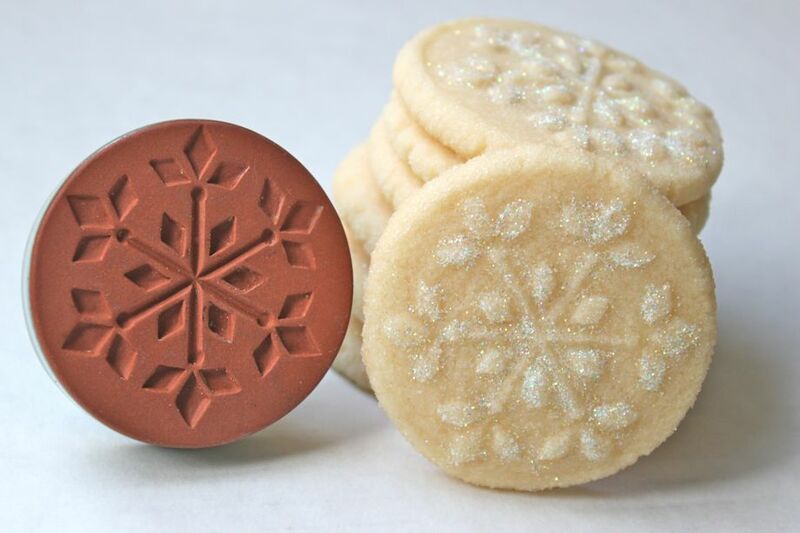 In honor of the 6″ of snow that fell yesterday, I baked a batch of snowflake-stamped shortbread cookies. How thrilling it was to see this much snow in the first week of November…and oh SO soon after Hurricane Sandy. Joy. This recipe is called “Recipe #2 – Shortbread” and it’s made with powdered sugar. In addition to the directions, I rolled the balls in granulated sugar before stamping* them…they looked SO pretty…and then I said a short prayer to the cookie Gods that they would look just as pretty after baking in the oven for 12 minutes. Not bad, huh? And they really taste delicious! Crispy, light and buttery. Yes. They were plenty pretty when I removed them from the oven but, since my mantra is “more-is-more”, I grabbed that bitty container of disco dust and made those snowflakes dazzle. So pretty and so delicious looking! I wish I can get the imprint like yours. It’s an older stamp, but if you check out the Rycraft website, they have one called Ice Crystal (#212) which is nearly identical to mine. Have fun, and thanks for taking the time to comment! Oh and you do it soooooo very well! I miss you but I received a special treat this morning of a delicious molasses cookie! Thank you for thinking of me! I hope my student gave you the HUGE hug I told her to give you on that early dismissal day! Thanks! With so many pretty stamps to choose from, I’m afraid this might become a new obsession. And there are lots of recipes, too. I’m thinking that I’ll try the brown sugar shortbread next! Well I know we will benefit from your adventure!